Boston firefighters battling a five-alarm fire at 27-29 Perrin St. in Roxbury Tuesday morning. 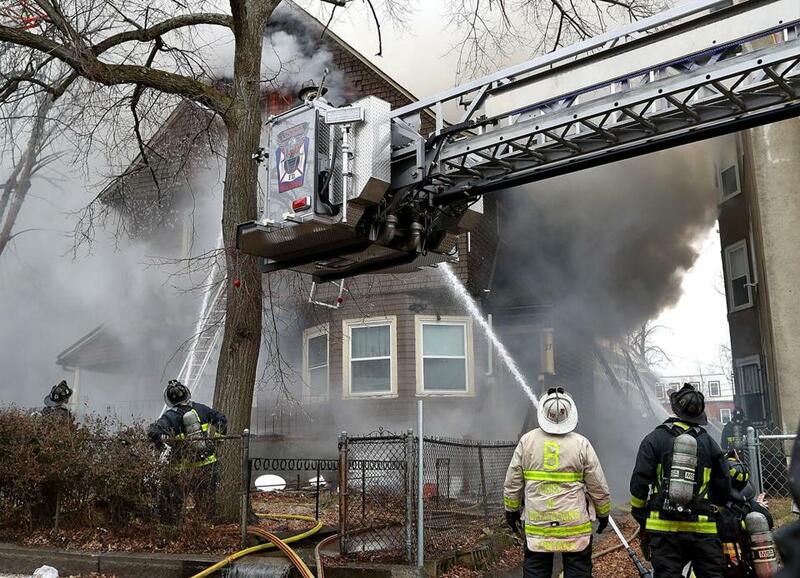 A five-alarm fire tore through a multifamily home in Roxbury Tuesday morning, displacing nine residents and sending two people to the hospital, including a 95-year-old neighbor who suffered smoke inhalation, authorities said. The blaze at 27-29 Perrin St. broke out around 9 a.m., and one occupant, an adult male, was taken to an area hospital for treatment of burns to his arm, according to the Boston Fire Department. A neighbor in her 90s also was transported to the hospital after being “overcome with smoke,” said Fire Commissioner Joseph Finn at the scene. The woman’s grandson, Corey Wright, identified her as 95-year-old Louise Wright. Finn said both victims’ injuries were not considered life threatening. Nine people including three children, he said, were displaced as a result of the fire. The interior of the residence looked gutted as firefighters began clearing the scene shortly after 11 a.m.
Only the man who suffered burns was home at the time of the fire, Finn said. No neighboring homes were evacuated, Finn added, but he struck a fifth alarm due to the smoky conditions and a senior housing unit located next to the affected property. Louise Wright does not live in the elderly housing complex; her property is located on the other side of the residence that caught fire. “The smoke condition was really, really down to the ground” as firefighters fought the blaze, Finn said. He estimated the damage at $750,000 and said the cause of the fire remains under investigation. Corey Wright said even his house next door was “filled with smoke,” and firefighters attacked the blaze from his roof. “First responders did an excellent job,” Wright said. Another neighbor, Hardik Goswami, 29, slept during the blaze and said he was stunned when he woke up and saw fire trucks lining the street. “I’m amazed,” he said. Mike Bello of the Globe Staff contributed to this report. Travis Andersen can be reached at travis.andersen@globe.com. Follow him on Twitter @TAGlobe.